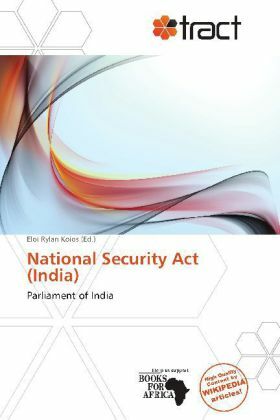 The National Security Act 1980 is an act of the Indian Parliament whose purpose is "to provide for preventive detention in certain cases and for matters connected therewith." The act extends to the whole of India except the State of Jammu and Kashmir. This act empowers the Central Government and State Governments to detain a person to prevent him/her from acting in any manner prejudicial to the security of India, the relations of India with foreign countries, the maintenance of public order, or the maintenance of supplies and services essential to the community it is necessary so to do. The act also gives power to the governments to detain a foreigner in a view to regulate his presence or expel from the country.